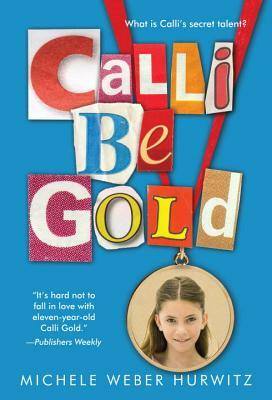 Eleven-year-old Calli Gold is the quiet third child in a family of loud overachievers. In fact, the family motto is Be Gold. Calli's sister is on an ice-skating team, and her brother's a basketball star. Her parents are sure she has a hidden gift for something. They just have to figure out what it is! But Calli has flopped at everything she's tried. She sure doesn't feel like a Gold. Until a new person enters her life. Second grader Noah Zullo might seem strange to some people, but Calli can't help liking him, and they become partners in their school's Peer Helper Program. When they create a booth for the Friendship Fair, they fill it with secrets and surprises. And as Calli and Noah work and learn together, they even surprise themselves. Michele Weber Hurwitz's debut is an endearing and gently humorous story about the true meaning of achievement and the important things an "ordinary" kid has to offer. MICHELE WEBER HURWITZ grew up in a suburb of Chicago and still lives in the same area with her husband and three children. She does not have a huge calendar taped to her kitchen wall but has been known, on occasion, to drive with Post-it notes stuck to the steering wheel. This is her first novel. Visit her at micheleweberhurwitz.com.